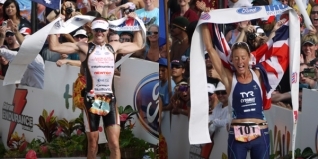 Wherever you looked before Kona, pretty much everyone - us included - was predicting a repeat of 2008, with a Craig Alexander / Chrissie Wellington double. And essentially...everyone was right, though quite how they achieved it was slightly different. In the case of Chrissie, it was business as usual... but in even more dominant fashion that usual! With a 54:32 swim, almost a two minute improvement on 2008, Chrissie exited the swim in the top ten, and then proceeded to unleash her power on the bike, eating up everyone ahead and making short work of hitting the front. By T2, Chrissie had recorded a 4:52 split, and held an 11 minute lead over Team TBB athlete Tereza Macel. At this point Rachel Joyce - remember, we did say "do keep an eye out for Rachel Joyce on the swim and bike especially" - had added a great cycle to her typically great swim, to hit the run course in fourth position almost ten minutes clear of race favourites such as Rebecca Keat, Mirinda Carfrae and fellow Brits Leanda Cave, Bella Bayliss and Cat Morrison. Out onto the run, Rebecca Keat and Mirinda Carfrae were flying...but when you are 25 plus minutes behind (! ), it's nothing to worry about... Chrissie was still extending her lead, and seemingly never lost the smile from her face all day. In fact, Chrissie spent much of the run trying to find out her position overall, including the men, as she was passing many of them like Pacman on a mission. Virginia Berasategui (ESP) moved into second place early in the run, having reached T2 in third, but despite a strong run, a flying Carfrae took second place in the last couple of miles, recording in the process the fastest female marathon of the day, in what was her first Ironman. In the process she set, provisionally, a new run course record (2:56:51). For Chrissie, that's eight iron-distance starts, eight wins, including three world championships, a world record and now the course record (8:54:02) at Kona. Stunning. Chrissie said ""I never thought I'd come here and break Paula's record. I feel kind of guilty doing it. I had to dig so hard to do it. I want to thank my family and friends for all their support - along with the crowd who were the wings beneath my wings when I needed them most." From Henry Budgett in Kona: "It all started so well... Third out of the water, bet that surprised the hell out of a few of the pro athletes, and away on the bike like a guided missile but, somewhere on the way to Hawi, it looks as though Phil Graves's engine has missed a beat or two." Phil did indeed get a fair amount of 'TV time', taking the lead early on in the bike leg, having exited the swim fourth. Three hours into the race however and the brave 20 year-old's challenge appeared to be fading, as the big names moved to the front. It was no surprise to to see Chris Lieto (USA) hitting the front alone shortly afterwards, and looking to gain a big lead on his strongest discipline. Only Mike Twelsiek (GER) could finish the bike within six minutes of the Lieto, with Faris Al-Sultan, Chris McCormack and Normann Stadler the only others within ten minutes. Race favourites Craig Alexander, Terrenzo Bozzone, Timo Bracht, Rasmus Henning & Co. were 12 minutes back at this stage, along with swift runner Andreas Raelert (GER). Lieto started the run strongly...and 21 miles later was still in the lead, having lead the race overall for over four hours. Alexander and Raelert overcame an early charge from 2007 champ Chris McCormack, running side-by-side and exchanging the lead for several miles before Alexander managed to pull away from the gutsy German, and finally catch Lieto with just five miles remaining. Lieto did his best to hold on to Alexander briefly, but it was only a matter of time before the reigning champion and race favourite showed his class and ultimately won his second Hawaii title in fine style. Lieto was fully deserving of his second place after such a gutsy ride, while Raelert showed that his second place at the Ironman 70.3 World Champs last year was no fluke, and that he has transferred his ITU pace to long distance racing with great success.